Is pre-workout nutrition as important as many people claim? Do you really need to eat before every workout? Read on to find out. One of the first pieces of bodybuilding advice I was given was on pre-workout nutrition. If I didn’t eat protein and carbs immediately before training, I was told, I’d miss an opportunity to accelerate muscle growth, if not directly hinder it. And so I did, before every workout, without fail. Chances are you’ve heard the same things. Bodybuilders and gymbros alike have been singing pre-workout nutrition’s praises for decades. How important is it really, though? Does eating before workouts actually help us build muscle faster? Pre-workout nutrition isn’t as crucial as many would have us believe, but it’s not entirely without merit, either. And in this article, you’re going to find out why. By the end, you’re going to know why pre-workout nutrition is even a “thing,” the ideal type of pre-workout meal, the truth about the “anabolic window,” and more. Should You Eat Protein Before You Work Out? Should You Eat Carbs Before You Work Out? Should You Eat Fat Before You Workout? Every day, your body is constantly breaking down and rebuilding muscle proteins. This process is known as “protein turnover,” and when viewed on the whole, breakdown and synthesis rates generally balance each other out. When you exercise, however, things change. Research shows that protein synthesis rates decline during resistance training and cardio, and that both protein synthesis and breakdown rates rise soon after you finish working out, with breakdown rates eventually overtaking synthesis rates. In other words, exercise is a catabolic activity, and this is especially true with fasted training and longer workouts. Now, mechanically speaking, muscle growth is the result of protein synthesis rates exceeding breakdown rates over extended periods of time. Therefore, if you want to gain muscle as quickly as possible, then you want to do everything you can to keep protein synthesis rates at or above breakdown rates. The more time your body spends in this anabolic state, the faster you gain muscle. That’s one of the reasons you need to eat enough calories and protein every day, why various strategies to accelerate muscle recovery can help, and why pre-workout nutrition is a staple in the world of bodybuilding. Dial down muscle breakdown and punch up muscle synthesis rates. That’s the idea, anyway. How does it actually play out, though? If you haven’t eaten protein in the 3 to 4 hours preceding your workout, then it’s a good idea to eat 30 to 40 grams or so before you train. If you have eaten protein in the last few hours, though, then you don’t need to eat more. You can just eat after your workout. Let’s take a minute to unpack this advice, because it not only helps you better understand “peri-workout” nutrition better, but nutrition and muscle building on the whole. It bumps up muscle protein synthesis rates and suppresses breakdown rates. It provides your body with the raw materials needed to build muscle tissue (amino acids). Furthermore, there’s evidence that eating a moderate amount of protein every 3 to 4 hours is superior for muscle building than eating smaller amounts more frequently or larger amounts less frequently. If you want to gain muscle and strength as quickly as possible, then you want to eat around 1 gram of protein per pound of body weight per day, and break it up into 4 to 6 separate servings timed a few (3 to 4) hours apart. Now, how does pre-workout protein fit into this picture? Well, while there’s evidence that combining protein with resistance training can magnify the workout’s effects on protein synthesis rates, I don’t think it’s strong enough to support the claim that pre-workout protein is absolutely vital under all circumstances. Instead, pre-workout protein should be viewed in the context of your diet on the whole. You see, if you haven’t eaten protein in the 3 to 4 hours preceding your workout, your body’s protein synthesis rates are going to be at a low baseline level. This means that your muscle building machinery will be idle, waiting for the next feeding of protein to kickstart it into action. Ideally, you’d eat another serving of protein more or less immediately after protein synthesis rates hit baseline, effectively keeping them maximally elevated through the entirety of your waking hours. Think of any time where your muscle building machinery is dormant as lost production time. Your body could have been building muscle, but instead, it was waiting for fuel. Now, if you go into a workout several hours after eating, you’re letting that machinery remain inactive even longer, and if you wait too long to eat after the workout, breakdown rates will exceed synthesis rates, which results in muscle loss. That’s why you should eat protein before you train if it has been a few hours since you last ate some. It’ll get your body building muscle again, and may even prime it to receive a larger anabolic boost from the training. This is why some studies have found that when subjects are in a fasted state, eating protein before a workout results in more muscle growth. If you have eaten protein in the hour or two before your workout, however, amino acids will be in your bloodstream, insulin levels will be elevated, and muscle protein synthesis rates will be humming. In this case, eating protein again before you work out won’t accomplish much, and that’s why research also shows that, in this case, eating protein before a workout doesn’t affect muscle gain. The research on eating carbs before a workout is clear: it improves performance. Specifically, eating carbs 15 to 60 minutes before working out will help you push harder in your training and may also aid in recovery and muscle growth. There are a couple physiological mechanisms in play here. First and foremost, eating carbs before training providing your body with an abundance of glucose (blood sugar) to burn for immediate energy, and this helps you in three major ways. The more glucose that’s available for your muscles to burn, the better you’re going to do in your workouts (and especially if they’re longer). Elevating blood glucose levels helps preserve the glycogen stored in your muscles. Glycogen is a type of carbohydrate stored in the body, and it’s the primary source of fuel for resistance training workouts. Thus, the further you dip into your body’s glycogen stores, the more likely you are to experience a drop in workout performance. Research also suggests that maintaining higher levels of muscle glycogen improves cellular signalling related to muscle building. What eating carbs before a workout won’t do, however, is directly induce more muscle growth. Unfortunately, carbs don’t have the same anabolic properties of protein. So, by eating carbs before you train, you’ll have more energy to push harder in your workouts, which will help you gain muscle and strength faster over time, and directly enhance your body’s ability to build muscle, which will also boost your gains over time. It’s also worth noting that studies have shown that simply swishing your mouth with a carb drink before can improve workout performance. Scientists aren’t exactly sure how this works, either. The most likely explanation seems to be that there are receptors in your mouth that are used by the brain to estimate energy availability. When these receptors detect carbohydrate, the brain interprets this as a signal that additional energy is available and that it can allow the body to engage in more strenuous physical activity. Interestingly, artificial sweeteners don’t seem to produce these benefits. You need actual carbs. Now, let’s talk types of carbs. What’s best for pre-workout nutrition? You don’t need to buy fancy, overpriced pre-workout carbohydrate supplements. They’re usually little more than tubs of simple sugars like maltodextrin or dextrose, which aren’t bad sources of pre-workout carbs per se, but don’t offer any special benefits, either. Research shows that for our purposes, ~30 to 40 grams of any type of carbohydrate eaten ~30 minutes before a workout will get the job done. And by “any,” I mean any: fruit, starch, simple sugars, etc. My favorite choices are nutritious whole foods like oatmeal, dates and figs, melons, white potatoes, white rice, raisins, and sweet potatoes. You can, but you don’t need to. There are several theories about how eating fat before a workout can improve performance, but the literature disagrees. A good summary of the existing research on the matter can be found in a paper published by scientists from Deakin University. Chalk up yet another strike against high-fat, low-carb dieting. Pre-workout supplements are incredibly popular, but what can they really do for you? Well, most can’t do much. They’re little more than proprietary blends of ineffective ingredients (L-arginine, for example) and ineffective doses of beneficial ingredients, like beta-alanine (“fairy dusting”). Others rely on large amounts of cheap stimulants and carbs to give you a jolt of energy that may make for a better workout, but also wipes you out. That’s why I created my own pre-workout supplement, PULSE. 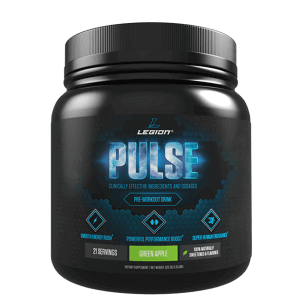 So, if you want to feel focused, tireless, and powerful in your workouts…and if you want to say goodbye to the pre-workout jitters, upset stomachs, and crashes for good…then you want to try PULSE. Nutrient timing is far less important than hitting your macros and sticking to a meal plan. Once those things are taken care of, though, optimizing when you eat what can help you build muscle faster. Fortunately, it’s not very complicated, either. Eat some protein and carbs every few hours. Eat before you train if you haven’t eaten in a bit. Eat after your workout, and sooner rather than later. Eat enough fat every day. And get most of your calories from nutritious foods. And you’ve got it made. What’s your take on pre-workout nutrition? Have anything else to share? Let me know in the comments below!